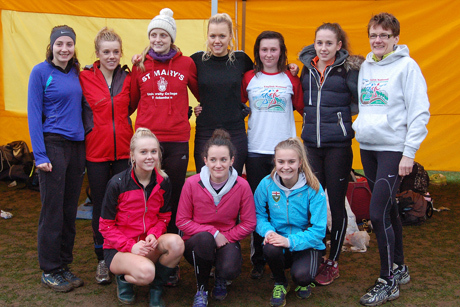 In the cold dismal light of Lightwater Valley Theme Park, RHAC Ladies held off a valiant challenge from the ever-present Homlfirth squad to retain their Yorkshire Cross-country Championship Title. The result could hardly have been closer. The scoring quartet of Laura Spence (8th) Sam Johnson (15th) Steph Burns (21st) and Robyn Lancely (22nd) scored the same points as Holmfirth (66), but Robyns excellent run in 22nd (recent training form has suggested that she would run well) meant that they won the title on last scorer position. Annabelle Grady and Natasha Hatswell played a pivotal part in the result, pushing Homfirths fourth scorer down the list into 36th position. The RHAC B team finished 7th and the C team an excellent 17th. Altogether we had 39 of the 48 entered athletes finish, and recorded 7 scoring teams - an excellent day for the club: U13 girls 2nd, U13 boys 8th, U15 boys 2nd, Senior Men 8th (and would have been 6th if Gareth Sampson had been eligible to score for the team). There were other excellent individual runs, with Mya Taylor (6th), Matthew Stevens (7th), Luke Cotter (2nd junior man), Emma Parkinson (8th Junior women) all also being candidates to represent Yorkshire in the Inter counties championships, in additiion to Laura. Mary Jenkinson was ill and Connor Ryan injured (broke ankle training on Monday evening) so those absences could have created more team medals and county athletes. Kyle Craib finished 9th in the Notts senior mens race. I cant find any Derbyshire results, so dont know at this stage how Ryan Beale fared.